So, I've been blogging since January. And I love it. 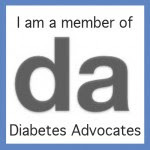 I do realize that people read my blog, mostly from the Diabetes Online Community. Some of you, I have never met. Some of you I have. But sometimes I forget that people I know in my everyday life read my blog. My mom. People at my church. My college friends. Until they say something, and then I'm all like, "Oh yeah..."
Sometimes I don't know what to say when someone outside the diabetes bubble says something about my blog. "Um, thanks," is about all I can usually muster. But sometimes it means a lot. Especially when it comes from people I really care about. Like my college roommates. Those three girls are some of my closest friends. They knew about my diabetes, but I didn't like to talk about it, so we didn't. I was more into the "pretend it doesn't exist" crap back then. Now, I'm more open about it. And those three girls read my blog. They listen to me talk about the DOC. They can tell how much you all have helped me, and that makes them happy. I am so blessed to have such wonderful friends! One of them did a guest post for me. Another one was present for this incident. And another encouraged me to tell her more about the DOC when I was still wary of talking about it. (Oh, come on, you know how some people think you're crazy when you try to explain the DOC). We sat on her couch, and she and her husband listened to me try to explain it. And they all have been so totally and completely supportive. I've talked to two of them on the phone this week. And they asked all about Simonpalooza. And listened to me go on and on about it. Because they are happy for me and they really do care! We have been friends for nearly ten years. Which is crazy, and makes me feel old, but that's another story for another time. We have been through a lot together, good and bad. It makes me so very happy that they have embraced this new direction my life has taken. The DOC has changed my life. No doubt about it. But so have these girls. And I need to remember that, to not get so wrapped up with my DOC friends that I ignore my other friends. If any of you three girls feel ignored, I am so sorry. And I am so, so excited that I get to see ALL THREE OF YOU very soon. And to all my "real life" friends. Those who have been there for the long haul. You have made a difference in my life. I am so blessed. So thank you, my friends. You know who you are. I love you. "But I know I'm who I am today, because I knew you"
"And now whatever way our stories end, I know you have re-written mine, by being my friend." It sounds like you have some amazing friends! I love that song from Wicked. I feel like each and every word was written for me and the people in my life. And her voice... I can't even handle it! I remember when you started your blog! We talked about all day on twitter lol. So glad you did. You have a beautiful heart and your girlies are lucky to have you!